A summary of the extensive evidence for its attribution is presented via the link below. Dr Jonathan Foyle's research and evidence as to the origins of the bed, and the DNA testing report of the bed. The furnishing of the Cadwalader mansion saw an unparalleled cooperation between the workshops of Benjamin Randolph and Thomas Affleck sharing the skills of a pool of immigrant carvers well-versed in the latest rococo fashions. The design of much of the furniture is based on the Lloyd family silver owned by John and Elizabeth Cadwalader (nee Lloyd), brought from London. The structure, form and material of the bed is consistent with Philadelphia manufacture as detailed in the Philadelphia Furniture price book, 1772. The rare detachable acanthus carved knee typical of the best Philadelphia rococo beds. The distinctive feature on the best Cadwalader furniture is a 'hairy paw' foot on a flattened ball. A walnut repair to the foot of the bed is consistent with a documented early repair to the post of a Cadwalader bed post. A trapped early fabric strand has been found - it is red, the same colour as documented for the original drapes of the principal Cadwalader bed. The bed was illustrated by Herbert Cescinsky, English Furniture of the Eighteenth Century, Vol II 1910, Cescinsky wrongly thought the bed to be English and pre Director. Width 5ft 2" wide x 7ft 3" long x 8ft 1" high, Mahogany, birch and tulip poplar. 5 ft Irish Lions Mask Four Poster Bed. A rare example of early Irish work attributed to the important Irish carver and gilder John Houghton, Golden Lane, Dublin. Circa 1740 with later restoration. Stunning Lions Mask carvings to posts, cornice and headboard. Substantial hairy paw feet to base of footposts. Chinese fretwork, dental cornice. Mahogany. Knowledge of John Houghton has recently been expanded by the exciting rediscovery of the autobiography of the English carver and designer, Thomas Johnson, well known for his pattern books of high rococo ornament published between 1755 and 1762. Johnson, described Houghton as 'much the best carver, in his line, in Dublin' and also called him 'the best wood-carver, for basso relievo figures, I ever saw before or since'. Johnson spent several months in Houghton's workshop in 1746 (see J. Simon, 'Thomas Johnson's The Life of the Author', Furniture History, 2003, pp. 1-64). 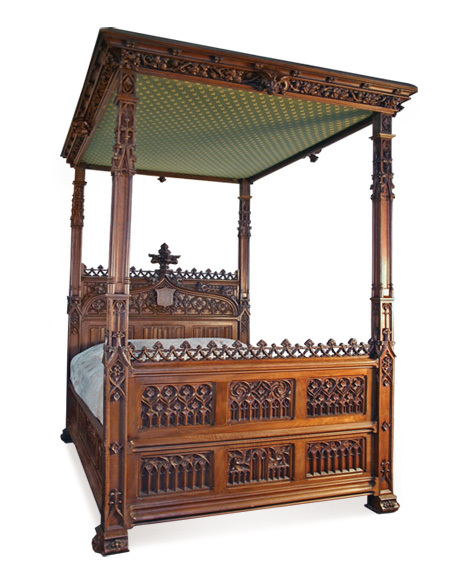 Neo Gothic Four Poster Bed c1855 by P Mazaroz. 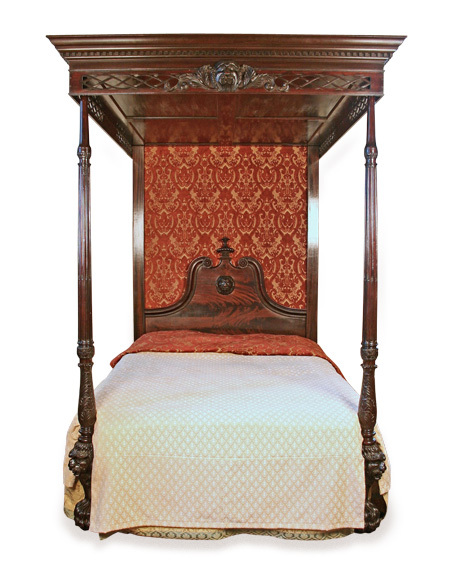 A neo gothic four poster bed in walnut from the workshop of P. Mazaroz of Paris (bed is stamped accordingly). Mazaroz supplied the wealthy of the mid to late 19th century, including Napoleon III and the Comte de Paris. He won medals at most of the major international exhibitions between 1855 and 1887 and helped organise some of the Paris Exhibitions. His clientele extended beyond the great Chateaus of France, supplying the Khedive of Egypt and the Russian Tzar. This is a magnificient example of his work. A gargoyle adorns all four sides of the bed to ward off evil spirits. The bed is stamped by the maker and is direct from a private French Chateau. This is a large four poster - 5ft (152.4cm) wide and over 9ft (274.3cm) tall. 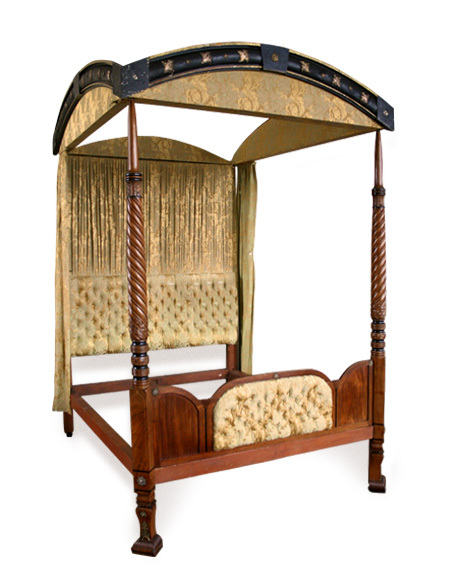 Fine Regency four poster bed originally from Dunster Castle. 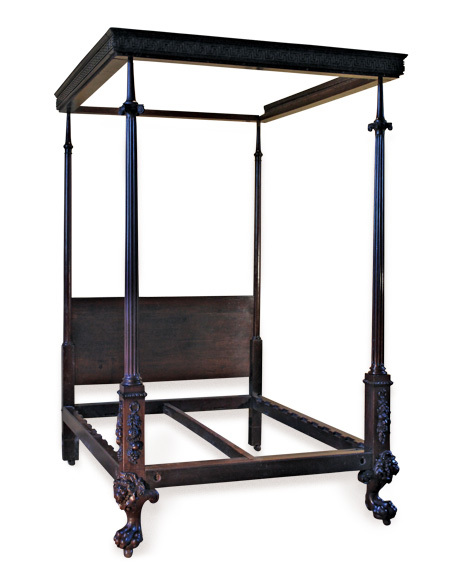 Regency four Poster, c1815 - 1820 made for the Lutterel family of Dunster Castle. Spiral twist mahogany posts with boxwood inlay and ebony stringing, terminating in a gadrooned foot with brass mounts. Ebonised domed top canopy with parcel gilt edging and applied gilt brass rosettes. The Egyptian style of the bed suggests the influence of Thomas Hope. The castle was bequeathed to the National Trust by Colonel Lutterrel and it remains a National Trust property. There remains a bed by the same maker at the castle, you can see a photograph. 9ft 3" (283cm) tall to canopy centre, 6ft 6" (170cm) wide, 6ft 11" (212cm) overall length. Kentian mahogany four poster Circa 1735. 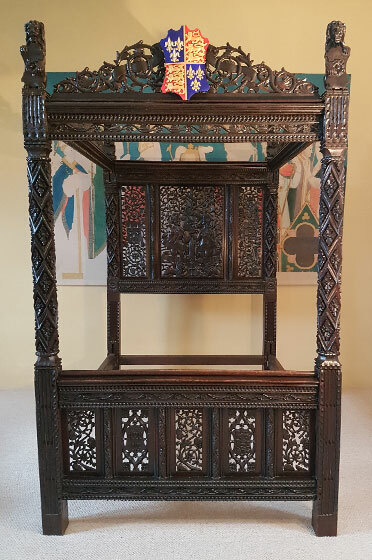 A masterpiece of early Georgian design and craftsmanship, attributed to Benjamin Goodison (Golden Spread Eagle, Long Acre, royal cabinet-maker to King George II). A very rare bed of outstanding design in the Palladian manner. The foot posts of fluted form with ionic capitals. The lower section with gadrooned moulding above a ring supporting a garland of foliage, fruit and flowers. A lion mask projecting from the corner above a monumental paw foot with recessed lignum vitae castors. The canopy with a Greek key pattern frieze. The complete framework of mahogany, later adapted to take slats. There are many similarities to the Goodison tables sold by Christies 9th May 1988 London, believed to have been commissioned for Stowe House, Buckinghamshire. A gilt settee and stool also attributed to Goodison and believed to originate from Stowe are in the Metropolitan Museum New York. 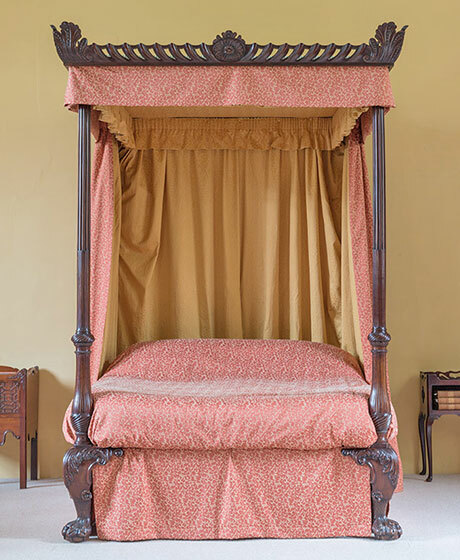 The bed is almost certainly the one mentioned in the Stowe catalogue 1848, Lot 1740 from the Plantaganet Rooms..." a capital mahogany four post bed-stead - carved with lion's heads, on French castors, with silk tabaret furniture and gilt cornice: and a palliasse". It is likely that the cornice was at one time parcel gilt as can be seen on the Goodison furniture with Greek key pattern at Longford Castle.